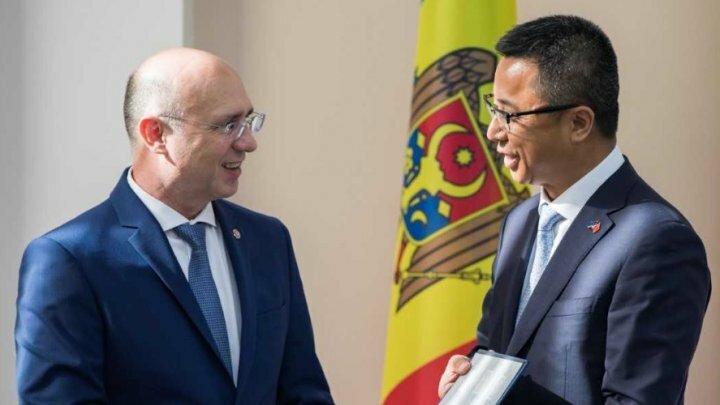 Moldovan PM Pavel Filip met Wednesday with a Chinese delegation of businessmen attending Moldova - China Business Forum. PM praised traditional friendship connecting our countries and believed that this forum would provide a platform for future partnerships. "We're in the 4th round of negotiations on the Free Trade Agreement (FTA) Moldova - China. I believe this agreement will enhance economic ties between our countries and Moldovan wine becomes more competitive on Chinese market", said Pavel Filip. PM Filip also invited Chinese businessmen to invest in our country and benefit from advantageous offers by FTA between Moldova with European Union (EU), Commonwealth of Independent States (CIS) and Turkey. "Investment in Republic of Moldova allows you to export goods free of charge to EU, CIS and Turkey markets", said PM Filip. Moreover, PM Filip referred to pro-business measures taken by government which create favorable conditions for business development. A number of facilities also provide the Free Economic Zones, Industrial Parks and Tekwill IT Park. "It's not a problem for Chinese citizens to apply for Moldovan visa as there is online visa system", said PM Filip. In turn, Chinese businessmen thanked Moldova for visa facilitation and showed interest to future investment in our country. They mentioned 20 companies from the delegation represent the most important areas including IT, tourism. PM Filip mentioned that during period April 21-28, a delegation of Economic Council along with PM will pay a working visit to China to take over best practices. There are 86 companies with Chinese investments currently active in the Republic of Moldova. The People's Republic of China is ranked 6th among the country's main trading partners.